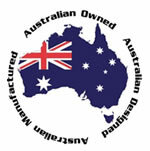 We custom manufacture step up transformers, suitable for stepping up from international voltages, to Australian power 240VAC. These are usually made to order, so there are many options avaiable. We are able to supply units with or without mains leads and plugs. These smaller units look similar to our step down transformers. However, the step up transformer has a US mains plug and Australian 240V outlet. These larger units are usually made to suit your application. Contact us with your requirements and we'll send you a quotation. Before ordering a step up transformer, first we need to determine the rating of your equipment. This will normally be marked on the back of the unit, near the power cord, or in the instruction manual. It will be given as Amps (A) or Watts (W). 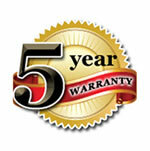 Now we have the equipment rating in VA, select a transformer slightly larger. ie. 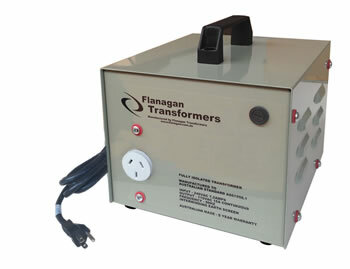 if your equipment is 1200VA, then you will need the 1650VA transformer. Three phase transformers are calculated differently, please see our three phase transformers page.